Does your special someone have a gluten allergy? 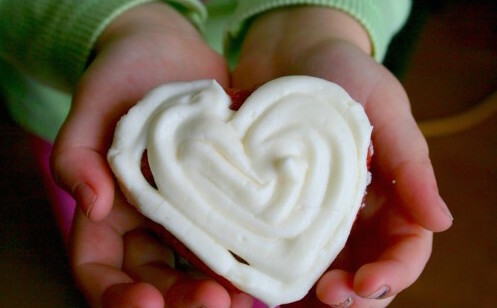 Are they unable to enjoy tasty Valentine’s Day treats because of this allergy? Don’t leave them out this Valentine’s Day, make them some gluten free red velvet cupcakes. The first time I tried this recipe was last year for Valentine’s Day, and it was my first attempt at making anything gluten free before. We invited friends over (who also have young children) for a Valentine’s dinner party. Being Valentine’s day and all I knew I wanted to make a dessert. I found the recipe on Gluten Free Cooking School’s website. 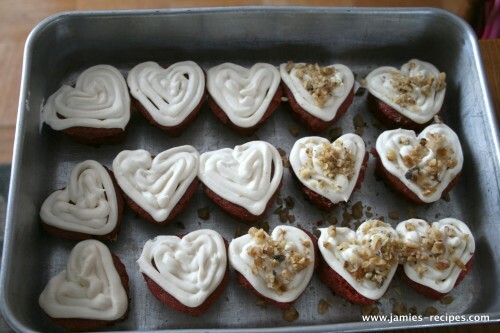 This year instead of making a whole cake I made little heart shaped cupcakes for my husband to bring to work. I am assuming everyone liked them, because the cake pan came back empty. 1 ounce red food coloring (this is one of the McCormickâs bottles) *I used just enough to give the batter a reddish color. Less than 1/4 of the bottle. Preheat oven to 350 degrees F. Cream together oil and sugar. Add one egg making sure it is completely mixed in before adding the other egg. Sift together all the dry ingredients (leaving out the cocoa powder) in a separate bowl. Add the flour mixture to the oil, sugar, and egg mixture in FOUR parts. Alternating the flour and buttermilk. Make sure the last one added is the flour mixture. Make a paste out of the vanilla, red food coloring, and cocoa powder, and stir into the batter. Pour batter into two greased and floured (GLUTEN FREE) round cake pans OR fill cupcake molds 2/3 the way full. Bake for 25 minutes for the cake pans OR about 18 minutes (turning pans about half way through) for the cupcakes. Test the cakes and/or cupcakes with a toothpick for doneness. In mixing bowl beat together cream cheese, butter, and vanilla until smooth. Add the sugar while mixing on low speed until incorporated. Increase the speed to high and beat until light and fluffy. You can stir in the chopped nuts or sprinkle the nuts on top of the frosted cupcakes. ENJOY! I tried to make these and they came out kinda gluey – very oily. What did I do wrong?